Weapons of Mass Destruction Finally Found in Upcoming Nuclear Outrun! SAN JOSE, Calif. – May 29, 2013 – Gamenauts, in conjunction with developers Nerdook Productions and Nightspade, today revealed their upcoming iOS remake of Nerdook’s Flash hit, Nuclear Outrun, enhanced with world-ending Weapons of Mass Destruction (yes, we found them)! The second in a series of games to be released under Gamenauts’ Asian indie mobile publishing initiative, Nuclear Outrun is set to explode on the App Store in July 2013 for iPhone, iPad and iPod Touch. Through some unforeseen (yet totally avoidable) world crisis, a nuclear missile is about to hit the city and it’s up to players to arm themselves and drive as far as they can before the explosion. Luckily, players can unleash those elusive Weapons of Mass Destruction such as George the cyborg T-Rex to gobble up zombies and the Teddy Bear Bomber that rains down terrors of cuddliness from the sky. Along the way, players need to rescue survivors such as Cheerleaders, Mimes, and Hipsters, each with their own special abilities. 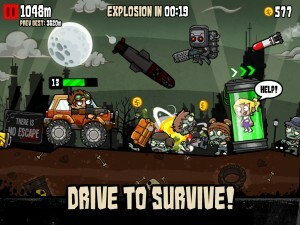 Players can also mow down zombies using an arsenal of weapons such as the Shark Gun, the Fart Bazooka, and the Twitgun that shoots out little hash-tag spewing bluebirds. Vehicles with different power-ups will also be available, from the Catmobile to the am-I-in-hell-yet Demonbike. The game also features a soundtrack by San Diego-based ska/punk band, The Skank Agents, to help lighten up the otherwise depressing setting. Unleash devastating Weapons of Mass Destruction such as George the laser-spewing T-Rex and the Teddy Bear Bomber. Rescue & collect 30 different survivor types, including Hipsters, Nurses, and Lawyers, each with their own unique perks! The further the player progresses, the more rare and powerful the allies. Escape in 18 vehicles from the cavity-inducing Ice Cream Truck, to the passive-aggressive Catmobile, to the overcompensating Terminatus X.
Annihilate zombies with 25 wacky weapons, including the nefarious Squid Launcher, the room-clearing Fart Bazooka, and the bloodthirsty Shark Gun. Activate Power-Ups such as the terrifying Chicken Rain and the Coins Unicorn. Compete with jealous friends and boast high scores on Game Center & Twitter. Rock out to a soundtrack from ska/punk band The Skank Agents! Nuclear winter is coming to the App Store in July 2013! Gamenauts is a leading game publisher and developer of Mobile, PC and Social Networks games, founded in the San Francisco Bay Area with a mission to explore the frontiers of interactive fun. They struck gold with hit games like Ninja Fishing on mobile and the Cate West and Burger Rush series in the PC casual gaming space. Gamenauts invites players to join them on their voyage through the galaxies of games on multiple platforms. Nerdook Productions is a one-man indie Malaysian developer of quirky and innovative Flash games. Since 2006, Nerdook has been one of the most popular developers on Kongregate and Armor Games and other Flash portals. Nerdook’s library boasts games of varying genres from role-playing, turn-based strategy to arcade shooters. Nightspade is an Indonesia-based mobile game development studio. Their talents span major platforms including but not limited to iOS, Android, Windows 8, Symbian, and Meego. They aspire to deliver happiness through mobile games for centuries to come.